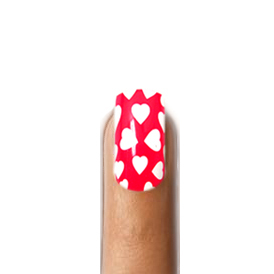 Charmed Hearts Nail Polish Strips with white hearts and light red background. Charm everyone with light white hearts on a flirty red background. Coveted Cosmetics real nail polish strips are ideal for girls on the go. They take minutes to apply and lasts for up to 14 days with proper care. No drying time necessary. Our nail strips are made with real nail polish. Comes in a package of 20 strips in total, enough to do your fingers and toes! The designs on them are detailed and crisp. To remove, use nail polish remover and the nail strips will wipe right off. Comes complete with nail file and cuticle stick.